Mommy is still trying to find ways to get out of the house and have some adult conversation. To that end, I invited myself to join a friend’s book club (thanks, Nikki!). The next pick is Ape House by Sara Gruen. Anyone want to read along? 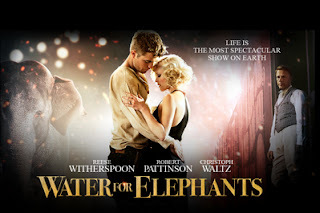 You may remember the author from the fantastic Water for Elephants. Soon to be a movie with the hottie Robert Pattinson (aka Edward) and Reese Witherspoon. Looks like the film is coming out April 22. Check out the trailer here. Poster from here – a website devoted to all things Kristen & Robert. Hilarious. I've started the book, and have some thoughts to share. But first, short story long (as is my style). I ordered a bunch of books from the library based on advice from "Uncle Stevie"(Steven King's column in Entertainment Weekly). Problem is, all 9 books came in at the same time. I reach into my 27 pound bag of books to begin working through them, and grab Ape House…not realizing it wasn't even one of "my" books. Well, I'm enjoying it, but I have to say that it's weird to read a book without any context (I never even read the book jacket). So, every plot twist seems bizarre…but interesting. A whole lot of Whoa, didn't see that coming. But, since no one has finished the book yet, I won't say any more. Yay! Mark stole the book from me & is already reading & enjoying it. Will you go see the movie with me?